Crews worked through the Wednesday morning rain to put the finishing touches on "A Capitol Fourth". Dancing With the Stars host Tom Bergeron will MC this year's show, which features performances from Barry Manilow, Scotty McCreery, Megan Hilty and many more. There will also be a special tribute to Neil Diamond. Executive Producer Michael Colbert says Diamond will debut a new song during the concert. "He was inspired to write it after the bombings in Boston at the marathon. We're going to have multiple first responders down here from Boston as Neil sings 'Freedom they'll never take us down,'" Colbert adds. Musical guests began rehearsing for the big event at 10 a.m. Wednesday. 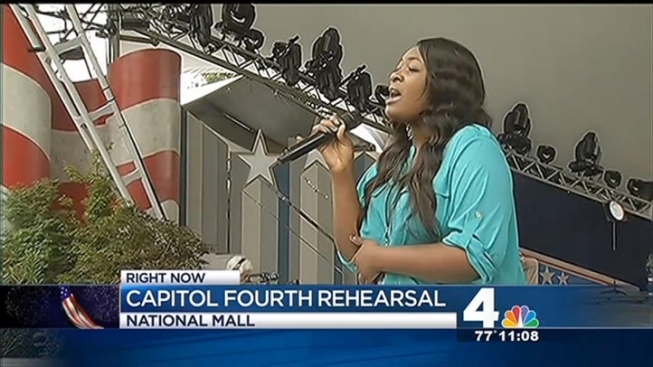 NBC4 caught a glimpse of American Idol winner Candice Glover's performance. A full dress rehearsal will be held at 8 p.m., and it's open to the public. "A Capitol Fourth" will be held on the West Lawn of the U.S. Capitol at 8 p.m. Thursday. The concert will go on rain or shine. However, if it does rain, the fireworks display will be rescheduled for Friday, July 5. Those hoping to stick closer to home can watch the show live on PBS.